Diabetic kidney disease (DKD) is associated with oxidative stress and mitochondrial injury. Myo-inositol oxygenase (MIOX), a tubular-specific enzyme, modulates redox imbalance and apoptosis in tubular cells in diabetes, but these mechanisms remain unclear. We investigated the role of MIOX in perturbation of mitochondrial quality control, including mitochondrial dynamics and autophagy/mitophagy, under high-glucose (HG) ambience or a diabetic state. 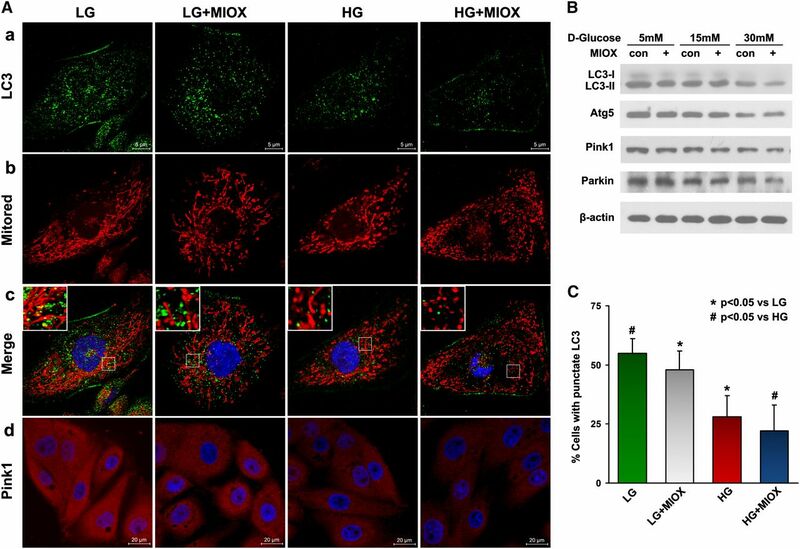 HK-2 or LLC-PK1 cells subjected to HG exhibited an upregulation of MIOX accompanied by mitochondrial fragmentation and depolarization, inhibition of autophagy/mitophagy, and altered expression of mitochondrial dynamic and mitophagic proteins. Furthermore, dysfunctional mitochondria accumulated in the cytoplasm, which coincided with increased reactive oxygen species generation, Bax activation, cytochrome C release, and apoptosis. Overexpression of MIOX in LLC-PK1 cells enhanced the effects of HG, whereas MIOX siRNA or d-glucarate, an inhibitor of MIOX, partially reversed these perturbations. Moreover, decreasing the expression of MIOX under HG ambience increased PTEN-induced putative kinase 1 expression and the dependent mitofusin-2–Parkin interaction. In tubules of diabetic mice, increased MIOX expression and mitochondrial fragmentation and defective autophagy were observed. Dietary supplementation of d-glucarate in diabetic mice decreased MIOX expression, attenuated tubular damage, and improved renal functions. Notably, d-glucarate administration also partially attenuated mitochondrial fragmentation, oxidative stress, and apoptosis and restored autophagy/mitophagy in the tubular cells of these mice. These results suggest a novel mechanism linking MIOX to impaired mitochondrial quality control during tubular injury in the pathogenesis of DKD and suggest d-glucarate as a potential therapeutic agent for the amelioration of DKD. Mitochondria are dynamic organelles that constantly undergo fusion and fission cycles to maintain a balance of cellular reticular network and mitochondrial turnover.10 Their dynamics are regulated by profission proteins (Drp1 and Fis1) and profusion mediators (Mfn1/2 and OPA1). During this process, the stress-induced dysfunctional mitochondria undergo fragmentation and membrane depolarization, and then, they are engulfed and degraded by the autophagosomes—a process known as mitophagy.11 In the mitochondrial lifecycle, mitochondrial fusion, mitochondrial fission, and mitophagy form an integrated quality control axis that prevents damaged mitochondria from accumulating within the cell, generation of reactive oxygen species (ROS), buildup of mutated mtDNA, and release of apoptogenic proteins (i.e., Cytochrome C). Thus, the cell avoids undergoing oxidative stress, mitochondrial outer membrane (MOM) permeabilization, and apoptosis, and such quality control maintains a population of healthy mitochondria.12,13 In kidneys, because of high energy demand in the mitochondrial-enriched tubular compartment, it is likely that mitochondrial dysfunctions in the diabetic state could contribute to cell injury, proteinuria, and loss of renal functions.4,14 However, the mechanism of mitochondrial damage and the dynamic regulation in states of hyperglycemia in tubular pathobiology are not clearly defined and remain to be investigated. Myo-inositol oxygenase (MIOX) is a tubular-specific enzyme that catabolizes myo-inositol to d-glucuronate, which enters into the pentose phosphate pathway.15,16 Other than its role to channel glucose intermediaries, studies have indicated upregulation of MIOX and its relevance in the pathogenesis of tubular injury in DKD.15,16 Previously, we had shown that the upregulation of MIOX during hyperglycemia could modulate redox imbalance by transcriptional mechanisms and also, conceivably, induce mitochondrial-dependent apoptosis, which inevitably may lead to tubulointerstitial injury and fibrosis.16–18 With respect to the amelioration of such an injury, d-glucaric acid, an anticancer drug, may serve as a potential pharmacologic inhibitor of MIOX.19 Interestingly, a derivative of this drug is believed to have a renoprotective effect in DKD by a yet to be defined mechanism.20 Also, the mechanism by which MIOX induces mitochondrial dysfunctions during tubular injury and whether its pharmacologic inhibition ameliorates DKD are unknown. In this study, we showed the effect of MIOX on mitochondrial quality control in tubules in DKD and highlighted the mechanism by which MIOX perturbs the mitochondrial homeostasis. Activated MIOX during hyperglycemia induces mitochondrial fragmentation and depolarization but meanwhile, inhibits autophagic removal of damaged mitochondria. The surveillance of quality control was noted to be disrupted, and accumulated dysfunctional organelles generated excessive ROS and initiated apoptotic cascade, leading to tubular injury. Importantly, inhibition of MIOX by d-glucarate normalized regulation of the mitochondrial lifecycle, and thus, it could serve as a potential therapeutic agent for the amelioration of tubulopathy in DKD. Confocal microscopy delineated mitochondrial morphology in HK2 cells after Mitotracker red staining. Under low-glucose (LG; 5 mM) ambience, mitochondria exhibited a filamentous shape, whereas they transformed into short rods after high-glucose (HG; 30 mM) treatment for 24 hours (Figure 1A, a). Immunoblot analyses revealed upregulation of the mitochondrial profission proteins Drp1 and Fis1, whereas the MOM profusion protein Mfn2 was downregulated. Interestingly, expression of OPA1, a protein regulating fusion of the mitochondrial inner membrane, was not obviously altered under HG ambience (Figure 1B). LC3 was used as an autophagy marker and the immunofluorescence performed by using LC3 antibody yielded punctate green fluorescence demarcating the autophagosomes (Figure 1A, b). After HG treatment, the number of autophagosomes as well as their intensity of fluorescence were reduced (Figure 1A, b). During autophagy, LC3-I is known to convert to LC3-II.21 Expression of converted LC3-II was decreased under HG ambience by immunoblot analyses, but no significant change was seen in Autophagy-Related Gene 5 (Atg5) (Figure 1C). In addition, expression of mitophagy-related proteins PTEN-induced putative kinase 1 (Pink1) and Parkin was decreased (Figure 1C). Cytosolic and mitochondrial ROS generations were increased notably by HG treatment, and they are indicated by H2-DCFDA (Figure 1A, green) and MitoSox (Figure 1A, red) staining, respectively (Figure 1A, c and d). An increase in apoptosis was also observed in cells subjected to HG, which was assessed by the terminal deoxynucleotidyl transferase-mediated digoxigenin-deoxyuridine nick end-labeling (TUNEL) procedure (Figure 1A, e). The apoptosis was accompanied with upregulation of Bax and Cytochrome C (Figure 1D). Notably, the level of the tubular-specific enzyme MIOX was increased under HG ambience (Figure 1, A, f and D). Quantitative analyses confirmed that HG induced mitochondrial fragmentation in a time-dependent manner, concurring with increased intracellular ROS production and apoptosis after HG treatment (Figure 1, E, G, and H). Autophagy was marginally increased initially, but it was reduced after 6 hours under HG ambience (Figure 1F). Effect of HG ambience on mitochondrial dynamics, autophagy, ROS production, and apoptosis in renal proximal tubular cells. (A, a) Under LG (5 mM) ambience, mitochondria exhibited a filamentous network, whereas they transformed into short rods after HG (30 mM) treatment for 24 hours. (B) Western blot analyses revealed upregulation of mitochondrial profission proteins Drp1 and Fis1; profusion protein Mfn2 was downregulated, whereas another fusion mediator OPA1 was not obviously altered. (A, b) By immunofluorescence microscopy, LC3, an autophagy marker, yielded an intense punctate green fluorescence highlighting the cellular autophagosomes, which was reduced under HG ambience. (C) By immunoblotting, expression of converted LC3-II was found to be decreased under HG ambience, whereas that of Atg5 was unaltered. Expression of mitophagy-related proteins, Pink1 and Parkin, was decreased. (A, c and d) Intracellular and mitochondrial ROS generation was increased by HG treatment, which was detected by H2-DCFDA (green) and MitoSox (red) staining. (A, e) By TUNEL procedure, an increase in apoptosis was observed in HK2 cells subjected to HG treatment. (D) The apoptosis was associated with upregulation of Bax and Cytochrome C. (A, f and D) The expression of MIOX, a tubular-specific enzyme, was also concomitantly increased. (E–H) Quantitative analyses confirmed HG-induced mitochondrial fragmentation in HK2 cells in a time-dependent manner, concurring with increased intracellular ROS production and apoptosis after HG treatment. Interestingly, autophagy was reduced only after 6 hours after the HG treatment. D-Glu, D-glucose. *P<0.05 compared with the LG (5 mM) group. To determine whether MIOX upregulation has any effect on mitochondrial fusion and fission processes, we used an MIOX stably transfected LLC-PK1 cell line that is available in our laboratory. The cells overexpressing MIOX have higher percentages of fragmented mitochondria under LG or HG ambience (Figure 2, A, a and b and C). This was accompanied with dose-dependent increased expressions of Drp1 and Fis1 under HG ambience, whereas the levels of Mfn2 were reduced compared with control cells under similar conditions (Figure 2, A, c and d and B). Cells transfected with MIOX and subjected to LG had Drp1 and Mfn2 fluorescence intensities similar to that of control cells treated with HG (Figure 2A, c and d). Notably, activated Drp1 was translocated to mitochondria in a dose-dependent manner, and this process was further accentuated in cells overexpressing MIOX (Figure 2B). In addition, a loss of mitochondrial voltage potential (ΔΨm) was seen under HG ambiance, which was assessed by TMRE staining, and it was further attenuated by MIOX overexpression (Figure 2, A, e and D). Accelerating effect of MIOX on the altered mitochondrial dynamics, associated proteins, and mitochondrial membrane potential under HG ambience. (A, a and b and C) MIOX overexpressing LLC-PK1 cells had higher percentages of fragmented mitochondria under LG or HG ambience. (A, c and d) Under LG ambience, MIOX-transfected cells had Drp1 and Mfn2 fluorescence intensity similar to the control cells treated with HG. (B) A dose-dependent increase in the expression of Drp1 and Fis1 was seen under HG ambience, whereas the expression of Mfn2 was slightly reduced. Translocation of Drp1 to mitochondria was also seen in a dose-dependent manner, and it was accentuated in MIOX overexpressing cells. (A, e and D) This was associated with a decrease in TMRE staining, indicating loss of mitochondrial voltage potential (ΔΨm). Con, control. During fission, the daughter mitochondria may undergo uneven division, and the ones with significant loss of membrane potential (ΔΨm) are likely to be segregated and eliminated by mitophagy, whereas healthy daughter mitochondria with increased voltage potential can undergo fusion to maintain mitochondrial homeostasis. These dynamic events lead to the maintenance of a purified mitochondrial pool and efficient cellular processes.22 In view of this dynamic interplay, the effect of MIOX overexpression on both autophagy and mitophagy was assessed. LC3 staining was used to mark autophagosome, whereas a combination of LC3 and Mitotracker red staining was used to delineate mitophagy. A reduction of autophagy was noted in cells overexpressing MIOX under LG or HG ambience compared with the control cells (Figure 3A, a). This was accompanied with increased mitochondrial fission, and the merged photographs indicated an associated reduction of mitophagy (Figure 3A, b and c). The decrease of autophagy was confirmed after enumeration of cells with punctate LC3 appearance (Figure 3C). Western blot analyses also indicated a reduced expression of autophagy-associated proteins (LC3-II and Atg5), and this decrease was dose dependent in cells subjected to HG treatment. The LC3-II expression was further attenuated by MIOX overexpression, especially under HG ambience, whereas Atg5 expression was largely unaffected (Figure 3B). In addition, expression of mitophagy-related proteins, Pink1 and Parkin, was reduced in a dose-dependent manner under HG ambience. Notably, their expression was not significantly changed by MIOX under LG but was inhibited by MIOX overexpression after HG treatment (Figure 3, A, d and B). Accelerating effect of MIOX on autophagy, mitophagy, and their associated protein expression under HG ambience. (A, a–c) Fluorescent punctate LC3 staining (green) was reduced in MIOX overexpressing cells in both LG and HG ambience, and this was associated with altered Mitored staining (red) and decreased LC3 and Mitored merged dots (yellow), indicating increased mitochondrial fission and decreased autophagy and mitophagy. (B) Western blot analyses revealed a reduced expression of LC3-II and Atg5 in a dose-dependent manner in cells subjected to HG treatment, and their expression was further attenuated by MIOX overexpression, whereas Atg5 expression was not obviously affected. (C) Quantification also indicated reduced cell percentage with punctate LC3 staining. (A, d and B) The expression of mitophagy-related proteins, Pink1 and Parkin, was also reduced under HG ambience, and their expression was further suppressed by MIOX overexpression when subjected to HG. Con, control. Failure of mitochondrial quality control and accumulation of damaged mitochondria may inevitably lead to oxidative stress and cell death. In view of this information, the effect of MIOX on ROS production and mitochondrial-dependent apoptosis was investigated. Both the intracellular and mitochondrial ROS levels were increased under HG ambience (Figure 4A). The cells overexpressing MIOX exhibited relatively higher intensity of staining with both H2-DCFDA and MitoSox probes, and statistics attested to these observations (Figure 4, A and B). For assessment of apoptogenic proteins Cytochrome C and Bax, double immunofluorescence was performed. Under LG ambience, cells with MIOX overexpression had higher degrees of fluorescence and altered distribution of both Cytochrome C (Figure 4C, green) and Bax (Figure 4C, red) as well as an increased number of apoptotic nuclei (Figure 4C, blue) (4′,6-diamidino-2-phenylindole [DAPI]), suggesting that MIOX alone may induce Cytochrome C and Bax redistribution that leads to subsequent apoptosis (Figure 4C, columns 1 and 2). While under HG ambience, MIOX further enhanced their redistribution and apoptosis (Figure 4C, columns 3 and 4). Western blot analyses clearly delineated the correlative changes that cytosolic Bax activated and translocated to mitochondria after HG treatment, whereas intramitochondrial Cytochrome C was released into cytosol. These changes were further enhanced in cells overexpressing MIOX, leading to accentuated apoptosis (Figure 4, D and E). Accelerating effect of MIOX on ROS production, Cytochrome C release, Bax mitochondrial translocation, and apoptosis under HG ambience. (A and B) Both intracellular and mitochondrial ROS levels were increased under HG ambience, which was measured by H2-DCFDA and MitoSox staining, respectively. The MIOX overexpressing cells exhibited relatively strong staining with both H2-DCFDA and MitoSox. *P<0.05 compared with the H2-DCFDA-stained LG group. #P<0.05 compared with the MitoSox-stained LG group. (C) The MIOX overexpressing cells had (columns 1 and 2) a higher degree of fluorescence, altered distribution of Cytochrome C (green) and Bax (red), and an increased number of apoptotic nuclei (blue; DAPI), whereas they were enhanced (columns 3 and 4) after HG treatment. (D and E) Western blot analyses indicated translocation of Bax into the mitochondria and that of Cytochrome C into the cytosol in a dose-dependent manner in cells subjected to HG treatment, which is exacerbated by MIOX overexpression, leading to increased apoptosis. Con, control; Cyt.C, Cytochrome C; cyto, cytosol; mito, mitochondria. MIOX expression was inhibited in HK2 and LLC-PK1 cells using MIOX siRNA and an inhibitor of MIOX, d-glucaric acid. The drug has been reported to suppress MIOX in tubular cells.19 Under HG conditions, cells transfected with MIOX siRNA or incubated with 10 mM d-glucaric acid had increased autophagy and mitophagy, which was evidenced by the increased number of punctate LC3 dots and Pink1 upregulation. At the same time, there was an attenuation of mitochondrial fragmentation and altered expression of mitochondrial-shaping proteins (Figure 5, A, a–c, B, C, and F). These changes were accompanied by reduced mitochondrial ROS production, decreased expression of Bax and Cytochrome C, and apoptosis compared with cells transfected with empty vector (Figure 5, A, d, D, and F). These observations indicated that MIOX inhibition could normalize the mitochondrial quality surveillance by attenuating mitochondrial fragmentation, generation of ROS, and apoptosis while accentuating mitophagy under HG ambience. To further explore the possible mechanisms by which MIOX disrupts the mitochondrial quality control axis and induces cell injury, we investigated two conceivable pathways that may relate to Pink1 regulation and MIOX-induced oxidative stress. As shown in Figure 5, A–F, cells transfected with Pink1 pcDNA plasmid and subjected to HG had reduced mitochondrial fragmentation and Drp1 levels but increased Mfn2 expression together with increased autophagy and mitophagy and decreased ROS generation and apoptosis. These cellular and biochemical changes are similar to those seen with MIOX knockdown. Interestingly, Pink1 overexpression had little effect on MIOX expression, whereas MIOX inhibition upregulated Pink1 expression compared with cells treated with HG (Figure 5F), suggesting that MIOX may serve as an upstream factor that negatively modulates Pink1 activity. In addition, cells pretreated with the ROS scavenger N-acetylcysteine (NAC) and then subjected to HG showed similar recovery of mitochondrial integrity and reduced apoptosis. Because MIOX has been shown to induce redox imbalance under HG ambience,18 this would indicate another conceivable pathway through which MIOX may disrupt mitochondrial quality surveillance. Furthermore, Pink1 has been recently reported to facilitate and enhance the protein–protein interaction between Parkin and Mfn2 on the MOM, which could induce activation of mitophagy.23 The coimmunoprecipitation experiments of this study indicated that, in tubular cells, HG inhibited the Parkin–Mfn2 interaction compared with LG (Figure 5G). Knockdown of MIOX under HG ambience upregulated Pink1 expression and increased the Parkin–Mfn2 interaction as well, whereas overexpression of Pink1 had similar and more prominent effects on such an interaction, which thereby enhance the process of mitophagy. This suggested that the negative effect of MIOX on mitophagy under HG ambience may be through the downregulation of Pink1 and consequentially, the reduced Parkin–Mfn2 interaction. These in vitro data indicated a key role of mitochondrial quality control in the maintenance of their homeostasis and cellular integrity, where MIOX may be critically involved in such pathobiologic processes. In view of this contention, we examined if inhibition of MIOX in vivo has a therapeutic potential in amelioration of tubulopathy in diabetic mice. 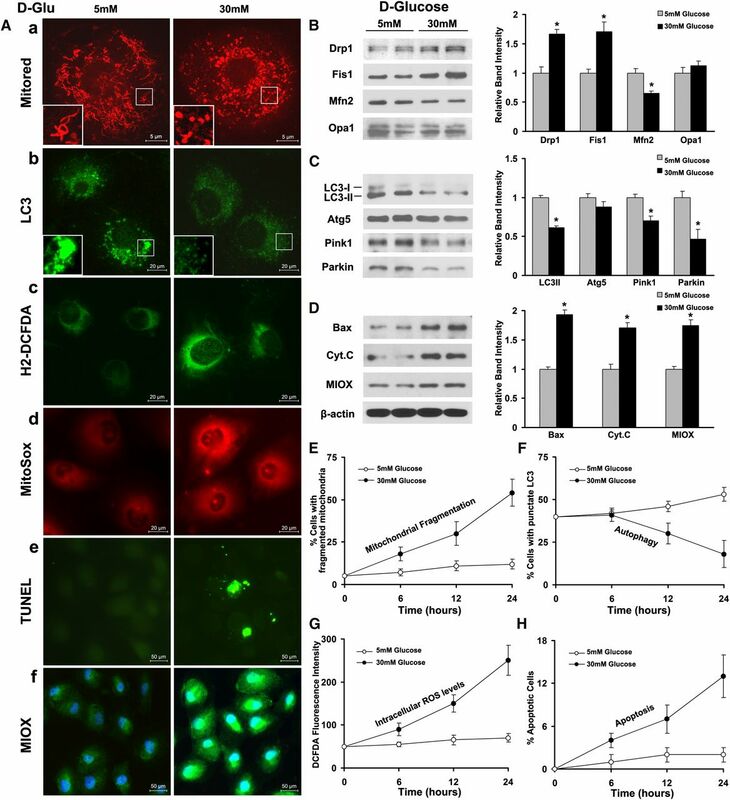 Attenuation of mitochondrial fragmentation, ROS, and apoptosis but increased autophagy and mitophagy after inhibition of MIOX under HG ambience. (A, a–c, B, C, and F) Under HG, cells transfected with MIOX siRNA or incubated with d-glucaric acid had increased expression of punctate LC3 and Pink1, indicative of increased autophagy/mitophagy, as well as decreased mitochondrial fragmentation and altered expression of mitochondrial shaping proteins. (A, d and D–F) This was accompanied with decreased mitochondrial ROS production, reduced expression of Bax and Cytochrome C, and apoptosis compared with empty vector-transfected cells treated with HG. MIOX may modulate mitochondrial quality control through two different mechanisms (i.e., Pink1 pathway and MIOX-induced oxidative stress). (A, columns 5 and 6 and F) Pink1 pcDNA-transfected cells had reduced mitochondrial fragmentation and Drp1 levels but increased Mfn2 expression together with increased autophagy and mitophagy and decreased ROS generation and apoptosis. Similarly, the cells pretreated with ROS scavenger N-acetylcysteine (NAC) and subjected to HG showed partial recovery of mitochondrial integrity and reduced apoptosis. (E and F) These changes were similar to those seen with MIOX inhibition, whereas MIOX has been shown to induce ROS and inhibit Pink1 expression. (G–I) The coimmunoprecipitation experiments indicated that, in tubular cells, HG inhibited the Parkin–Mfn2 interaction, whereas knockdown of MIOX upregulated Pink1 expression and increased the Parkin–Mfn2 interaction. The overexpression of Pink1 had similar and more prominent effects on such interactions. Cyt.C, Cytochrome C; D-Glu, D-glucose; IP, immunoprecipitation; WB, Western blot. *P<0.05 compared with HG plus the empty vector group. d-glucarate, the calcium salt of d-glucaric acid, was added to the mouse dietary chow (1% or 2% [wt/wt]) to inhibit MIOX. Four groups of mice (n=8 per group) were assigned: control CD1, streptozotocin (STZ)-induced diabetic, and STZ+1% or STZ+2% d-glucarate dietary supplementation groups. d-glucarate treatment was initiated after 1 week of STZ injection and continued for another 8 weeks. During this time frame, body weight, blood glucose, serum creatinine, and urinary albumin-to-creatinine ratio (ACR) were monitored. Compared with controls, the STZ group had higher blood glucose levels and increased in serum creatinine and urinary ACR values but reduced body weight (Figure 6, A–D). The diabetic mice receiving d-glucarate had a smaller reduction in body weight and slightly reduced blood glucose as well as notably decreased serum creatinine and urinary ACR compared with the STZ group (Figure 6, A–D). Interestingly, mice with 2% d-glucarate treatment had better preservation of renal function than those receiving 1% d-glucarate. Morphology studies revealed increased periodic acid–Schiff-positive tubular brush border staining, which is indicative of protein excretion, notable tubular epithelial disruption, hypertrophy of glomeruli, and increase of mesangial matrices in the STZ group. The diabetic mice with drug treatment showed notable improvement largely in the tubular compartment with less cellular disruption (Figure 6E). Similar tubular alterations as well as changes in mitochondria morphology were observed after Toluidine blue staining of EPON-embedded sections (Figure 6F). In the control group, the mitochondria appeared cylindrical, elongated, and well organized. However, the organelles were fragmented and scattered in tubules as well in their lumens in the STZ group. There was partial recovery in mitochondrial morphology along with improvement in tubular cell integrity in the STZ and d-glucarate groups. Quantitative analyses with damage scores ranging from zero to three indicated that both the STZ+1% and STZ+2% d-glucarate groups had slightly reduced glomerular damage but notable decrease of tubular damage compared with the STZ group (Figure 6, H and I). Concurrently, the MIOX expression and activity (Figure 6, G and J) were markedly increased in proximal tubules in the STZ group compared with controls and notably attenuated in STZ-treated mice administered d-glucarate. Ameliorative effect of d-glucarate on renal functional and morphologic characteristics by modulation of MIOX expression in STZ-induced diabetes in mice. (A–D) The STZ-treated group had higher blood glucose levels, an increase in serum creatinine and urinary ACR values, and reduced body weight compared with the controls. In general, the diabetic mice receiving 2% d-glucarate had better preservation of renal functions than those receiving 1% d-glucarate. (E) Increased periodic acid–Schiff (PAS)-positive tubular brush border staining, tubular epithelial disruption, hypertrophy of glomeruli, and mesangial matrix numbers were observed in the STZ group. Treatment of diabetic mice with d-glucarate had notable improvement (largely in the tubular compartment) with less cellular disruption. (F) In the tubules of the control group after Toluidine blue staining, the mitochondria appeared cylindrical, elongated, and well organized. The mitochondria were fragmented and scattered in the STZ group. A partial recovery in mitochondrial morphology along with improvement in tubular cell integrity was seen after 1% or 2% d-glucarate administration. (H and I) Quantitative analyses with damage scores ranging from zero to three indicated that d-glucarate treatment resulted in amelioration of changes in glomeruli and tubules after STZ induction of diabetes. (G and J) Concurrently, MIOX expression and activity were decreased in diabetic mice receiving d-glucarate. DG, d-glucarate. *P<0.05 compared with the STZ group; #P<0.05 compared with the control group. To confirm alterations of mitochondrial morphology as observed by Toluidine blue staining, expression of mitochondrial-shaping proteins and organelle ultrastructural changes were assessed. The mitochondrial profission proteins Drp1 and Fis1, expressed mainly in renal tubules by immunohistochemistry, were upregulated in the STZ group, but their in situ expression was reduced to a certain extent in STZ+1% or STZ+2% d-glucarate groups (Figure 7A, a and b). Conversely, Mfn2 levels were notably decreased in tubules of the STZ group but partially restored in some of the proximal tubules after d-glucarate treatment (Figure 7A, c). These results suggested a restoration of disrupted mitochondrial dynamics by d-glucarate in tubules of diabetic mice. Next, status of mitochondrial morphology was assessed by electron microscopy. In the control group, the majority of the tubular cells had elongated cylindrical-shaped mitochondria (marked by the asterisks in Figure 7, B and F). In the STZ group, >50% of the tubular cells exhibited fragmented mitochondria; the mitochondrial morphology was partially restored by d-glucarate supplementation, and the percentage of tubular cells having fragmented mitochondria was reduced. High-magnification electron microscopy (Figure 7, C–E) revealed elongated mitochondria with organized cristae in the control group (Figure 7C). However, in the STZ group, most mitochondria exhibited rod or sphere shapes and had cristolysis with focal disruption of the inner mitochondrial membranes (Figure 7D). These changes in the diabetic group were partly restored after administration of d-glucarate, and they showed the morphologic features of the mitochondrial fusion–fission process (the fragmented mitochondria in the hyperglycemic state underwent refusion to form elongated mitochondria after d-glucarate treatment) (Figure 7, E and F). Restoration of altered tubular mitochondrial morphology in diabetic mice after administration of d-glucarate. (A) The mitochondrial profission proteins Drp1 and Fis1, expressed mainly in renal tubules, were upregulated in the STZ group, but their expression was reduced after administration of d-glucarate. Conversely, expression of mitochondrial profusion protein Mfn2 was decreased in the STZ group but partially restored in some of the proximal tubules after drug treatment. (B and F) By electron microscopy, the majority of the tubular cells had mitochondria with elongated cylindrical shape (yellow asterisks) in the control group, whereas in the STZ group, about 50% of the tubular cells had fragmented mitochondria, and their morphology was partially restored by d-glucarate treatment. (C) Higher magnification electron micrographs showed elongated mitochondria with organized cristae in the control group. (D) In the STZ group, mitochondria showed a spherical shape and had undergone cristolysis (matrix vacuoles). (E) These changes were negated after d-glucarate treatment, and mitochondria undergoing fusion are seen. (F) The mitochondrial changes were quantified and included in bar graphs. DG, d-glucarate; EM, electron microscopy. *P<0.05 compared with the STZ group; #P<0.05 compared with the control group. 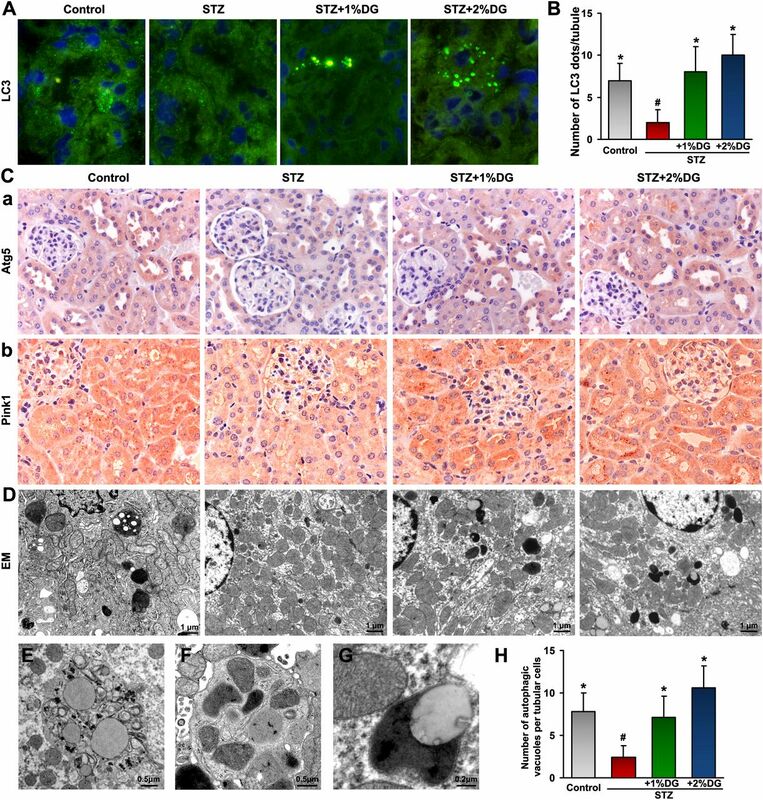 Various morphologic studies were performed to investigate the changes of autophagy and mitophagy in STZ-induced diabetic mice and the effect of MIOX inhibitor on these pathobiologic events. Frozen kidney sections from four groups were stained with LC3. A basal degree of autophagy, which was indicated by punctate LC3 appearance in renal tubules, was seen in the control group. The LC3 staining was greatly reduced in tubules from the STZ group, and the formation of autophagosomes was partially restored or enhanced after d-glucarate treatment (Figure 8A). The morphometric analyses showed that the number of autophagosomes per tubule in the STZ and d-glucarate groups was much higher than that in the STZ group and comparable with or higher than that in the control group (Figure 8B). Meanwhile, Atg5 and Pink1 showed parallel changes in the tubules of mice from four groups, and their in situ expression was reduced in the STZ group but partially restored after d-glucarate treatment (Figure 8C). The status of autophagic vacuoles, including autophagosome and autolysosome, was evaluated by electron microscopy. Autophagic vacuoles were reduced in tubular cells in the STZ group compared with the controls, whereas they were partially restored in tubules from mice treated with 1% d-glucarate and even enhanced in the 2% drug-treated group (Figure 8, D and H). High-magnification electron micrographs depicted a typical morphology of autophagosome containing fragmented cellular organelles (Figure 8E). An autophagosome-engulfing mitochondria, indicative of mitophagy (Figure 8F), and an autolysosome (Figure 8G) were readily seen in tubular cells of d-glucarate–treated groups, suggesting restoration of autophagy and mitophagy. Restorative effect of d-glucarate on autophagy and mitophagy in STZ-induced diabetic mice. (A) The basal level of autophagy, indicated by punctate LC3 staining, was seen in the renal tubules of the control group, which disappeared in the tubules of the STZ group, whereas they were restored after d-glucarate treatment. (B) Morphometric analyses confirmed these observations. (C) The expressions of Atg5 and Pink1 exhibited parallel reduction and restoration in the tubules of mice from four groups. (D and H) By electron microscopy, autophagic vacuoles seen in the control group were greatly reduced in proximal tubular cells in the STZ group, whereas they were restored in tubules from mice treated with d-glucarate. (E) Higher magnification electron micrographs revealed a typical morphology of an autophagosome containing fragmented cellular organelles, (F) a mitophagosome, and (G) an autolysosome in tubular cells after d-glucarate treatment. DG, d-glucarate; EM, electron microscopy. *P<0.05 compared with the STZ group; #P<0.05 compared with the control group. Expression of one key apoptogenic protein, Bax, was found to be increased in tubules of the STZ group, and it was partially inhibited by d-glucarate treatment in diabetic mice (Figure 9A). Similarly, Cytochrome C, which is normally confined to the mitochondrial matrix in the control group, was seen released into the cytosol in the STZ group with concomitant upregulation of MIOX (Figure 9B). However, lesser degrees of Cytochrome C redistribution together with the suppressed expression of MIOX were noted in tubules of the STZ mice treated with d-glucarate. 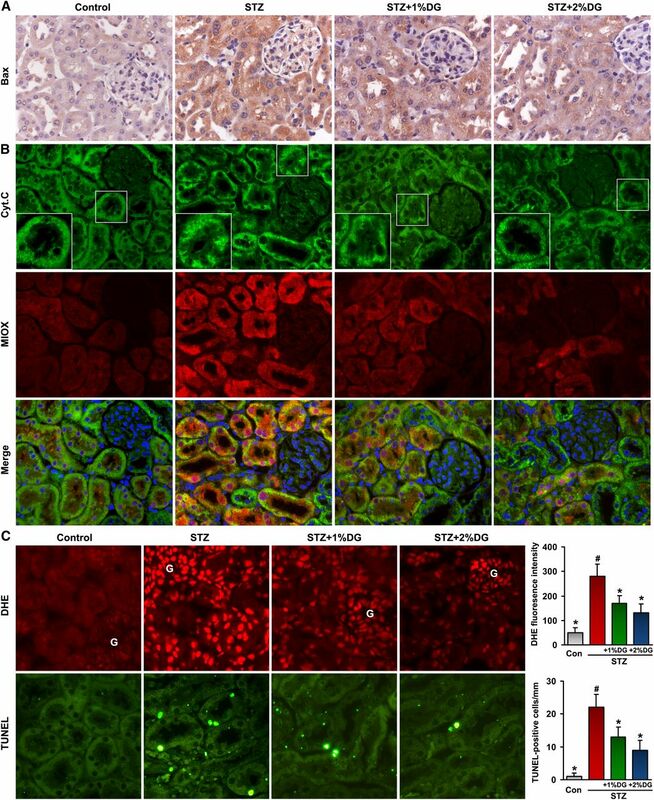 The renal tissues of the STZ group subjected to DHE or TUNEL staining showed concomitant increases of oxidative stress and apoptosis, both of which were largely reduced with d-glucarate treatment, especially in tubules (Figure 9C). These observations suggest that d-glucarate, by inhibiting MIOX, exerts antioxidant and antiapoptotic effects in the renal tubular compartment of diabetic mice. Reduction in the expression of apoptogenic proteins, ROS production, and apoptosis in STZ-induced diabetic mice after d-glucarate administration. (A) Expression of Bax was found to be increased in tubules of the STZ group, which were partially inhibited by d-glucarate treatment in diabetic mice. (B) Similarly, Cytochrome C, normally confined to the mitochondria, was seen diffusely distributed in the cytosol in the STZ group with concomitant upregulation of MIOX, and this redistribution was suppressed with the d-glucarate treatment. Their concomitant changes were readily seen in the merged (MIOX and Cyt.C) images. (C) An increase in DHE and TUNEL staining, indicative of increased oxidative stress and apoptosis, respectively, was observed in the STZ group, and both were greatly reduced with the d-glucarate treatment, especially in tubules. Con, control; Cyt.C, Cytochrome C; DG, d-glucarate; G, glomerulus. *P<0.05 compared with the STZ group; #P<0.05 compared with the control group. Glomerular lesions have been the major focus of investigation in DKD; however, in recent years, the importance of specific tubular changes has also been emphasized. The features of tubulointerstitial histopathology include inflammation and apoptosis, which are not necessarily secondary to glomerular lesions.7,24–26 In addition, tubular injury alone is believed to be closely correlate with clinical manifestations of DKD, including the extent albumin excretion and its degradation in tubules. The latter may serve as a primary key site for the development of DKD, because tubular injury has been described to be a better predictor in the progression of the renal disease.3,4 Thus, the dominant glomerulocentric view of DKD has partly shifted to tubules, and the injury has been described as diabetic tubulopathy.3 In this study, notable changes in the tubules were also observed in STZ-induced diabetic mice (Figures 6 and 7). This brings up an important question of whether attenuation of tubular damage by therapeutic approaches can delay or reverse DKD progression? Our results (Figure 6) indicate that d-glucarate, an MIOX inhibitor, not only ameliorates diabetic tubular injury but also, improves the renal functions, which are reflected by decreased serum creatinine levels and urinary ACR. Interestingly, d-glucarate also attenuated glomerular damage to some extent, suggesting a possible link between tubular injury and glomerular burden during the development of DKD. 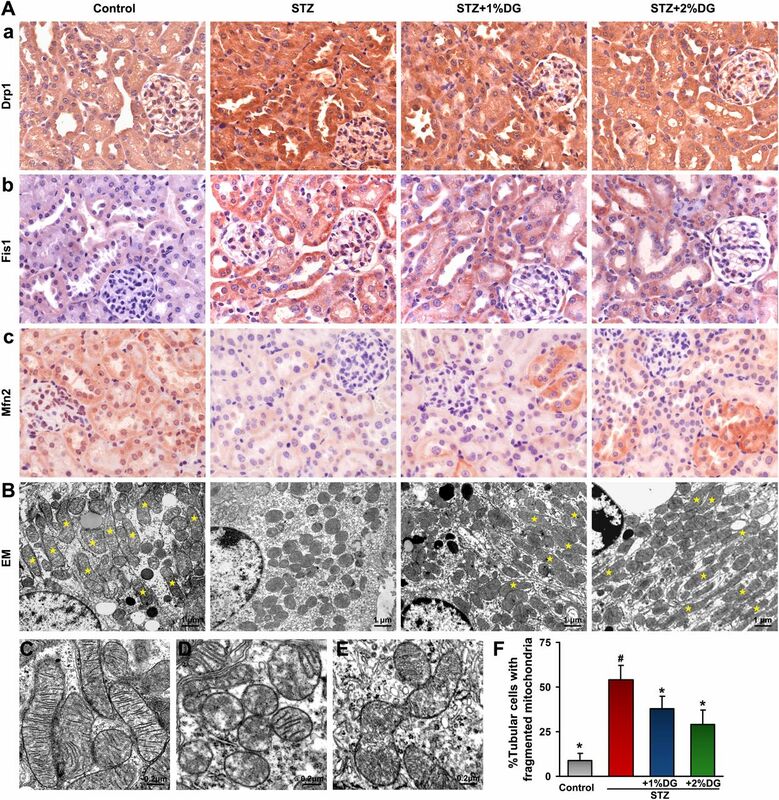 Similarly, recent studies by Lin et al.26,27 showed that inhibition of TLR4 in the tubules of diabetic mice led to reduced albuminuria, BUN, glomerular hypertrophy, and glomerulosclerosis in addition to attenuation of tubulointerstitial injury. In this regard, the approach targeting the tubular compartment with respect to mitochondrial homeostasis can be beneficial for the overall amelioration of DKD. Mitochondria are abundantly present in tubular cells to meet high metabolic energy demand, such that they play a pivotal role in the pathogenesis of acute or chronic tubular injury.10,28,29 Recent studies have delineated an integrated regulation of the mitochondrial lifecycle.11,22 The dynamic nature of mitochondria enables them to constantly undergo fusion and fission cycles, whereas the selective autophagic removal of damaged organelles (mitophagy) purifies the mitochondrial pool, all of which form an integrated quality control axis to maintain mitochondrial homeostasis. This concept of mitochondrial quality control is intricately related to mitochondrial dynamics and mitophagy, and it has been investigated in various diseases,12,30–32 but studies on mitochondrial quality control in kidney diseases, including DKD, are somewhat limited. A few reports have indicated a pivotal role of mitochondrial dynamics in the homeostasis of different kidney cells during DKD and AKI.8,28 However, autophagy is believed to exert a cytoprotective effect during kidney injury, such as in AKI, DKD, and obesity, where the basal rate of autophagy may increase initially but because of its relative decrease, subsequently, the podocytes and tubular cells get readily damaged.33–36 In addition, elimination of damaged mitochondria by mitophagy was reported to be relatively deficient or decreased in the cardiac musculature of patients with diabetes.37 Similarly, two mitophagy regulators, Pink1 and Parkin (the genes that are relevant in the pathogenesis of Parkinson disease), were found to be downregulated in cardiac and skeletal muscles in diabetic states.37,38 In this study, we observed that most of the mitochondria within the injured tubules in STZ-induced diabetic mice were fragmented and had a randomly disorganized cellular distribution (Figures 6F and 7B). At the same time, the cellular autophagic vacuoles and mitophagy were reduced in tubules, indicating less efficient removal of damaged mitochondria and a compromised surveillance mechanism. Importantly, increased mitochondrial fragmentation and reduced autophagy or mitophagy under HG ambience were observed in tubular cells in both our in vitro and in vivo studies (Figures 2, 3, 7, and 8). These two cellular events together indicated an impaired mitochondrial quality control, which may inevitably result in excessive ROS generation and initiation of the mitochondrial apoptotic cascade (Figures 4 and 9). Next, the question needs to be addressed of what caused the mitochondrial quality control failure to rescue the damaged mitochondria. It is conceivable that MIOX may have interfered with the mitochondrial self-rescuing process. MIOX, a tubular enzyme, is upregulated during HG ambience, and its critical involvement in the pathogenesis of DKD has been shown.15–18 During hyperglycemia, MIOX induces redox imbalance and mitochondrial dysfunction that could result in tubular oxidative injury and apoptosis.17,18 In view of this contention, the underlying mechanisms by which MIOX may cause mitochondrial dysfunction and tubular cell injury were delineated. As shown in Figure 10, under HG ambience, MIOX is upregulated in tubular cells,16–18 and then, it modulates mitochondrial dynamics through two conceivable pathways. In the first pathway, MIOX increases intracellular ROS generation through transcriptional mechanisms,18 which would then activate cytosolic Drp1 and promote its mitochondrial translocation, leading to mitochondrial fragmentation.10,39 In the second pathway, elevated MIOX levels would suppress Pink1 expression, which has a negative regulatory effect on Drp1 activity, such that the Pink1 deficiency would increase Drp1-dependent mitochondrial fragmentation.40 In other words, excessive ROS generation and paucity of Pink1, both induced by MIOX, lead to Drp1 activation and translocation to mitochondria. Subsequently, Drp1 interacts with Fis1 on the MOM and causing mitochondrial fragmentation. Excessive fragmented mitochondria are depolarized and lose viability for the fusion process, but the quality control of mitochondria allows these injured organelles to be recycled by autophagosomes through mitophagy. However, under HG ambience, activated MIOX inhibited Pink1 and conceivably, prevented its downstream Parkin translocation to mitochondria, thus blocking subsequent interaction between Parkin and Mfn2 on MOM. Eventually, these events led to a compromise in the process of mitophagy. As a result, the accumulation of fragmented and damaged mitochondria triggered ROS overproduction as well as the mitochondrial apoptotic pathway—a process by which the apoptogenic Bax translocates and inserts into mitochondria, whereas Cytochrome C is released into the cytosol, leading to Caspase 9 activation and eventually, apoptosis. Conversely, inhibition of MIOX by d-glucarate restores mitochondrial quality surveillance by preventing mitochondrial damage and cellular apoptosis, thereby attenuating diabetes-induced tubular damage. Schematic diagram depicting the conceivable cellular events by which MIOX disrupts mitochondrial integrity under HG ambience, which results in renal tubular cell injury. Under HG ambience, MIOX is upregulated in tubular cells, which then modulate mitochondrial dynamics through two conceivable pathways. (1) MIOX increases intracellular ROS generation through transcriptional mechanisms, which promote Drp1 activation and mitochondrial translocation.10,18,39 (2) Upregulated MIOX reduces Pink1 expression, which has a negative regulatory effect on Drp1 activity, such that Pink1 inhibition would increase Drp1-dependent mitochondrial fragmentation.40 In this regard, Drp1 is activated and translocates to MOM through these possible MIOX-mediated pathways, where it interacts with Fis1, which would lead to mitochondrial fragmentation. Excessively fragmented mitochondria are depolarized and lose viability for the fusion process, but the surveillance of mitochondrial quality control allows these injured organelles to be recycled by mitophagy. However, under HG, both autophagy and mitophagy are suppressed, partly because of the activation of MIOX, which inhibited Pink1 and conceivably, prevented subsequent Parkin translocation into mitochondria, thus blocking the interaction between Parkin and Mfn2 on MOM that eventually resulted in a compromise in the process of mitophagy. As a result of insufficient autophagic removal of mitochondria, the accumulation of fragmented and damaged mitochondria triggered ROS overproduction as well as the mitochondrial apoptotic pathway, by which the apoptogenic Bax translocates and inserts into mitochondria, whereas Cytochrome C is released into the cytosol, leading to apoptosis. Interestingly, pharmacologic inhibition of MIOX by d-glucarate restores mitochondrial quality control machinery by preventing mitochondrial damage and cell apoptosis, thereby attenuating hyperglycemia-induced tubular damage. Cyt.C, Cytochrome C.
Of note, d-glucarate is a natural compound, and it is present in substantial amounts in certain fruits and vegetables. Daily supplementation of d-glucarate has some key beneficial effects (i.e., detoxification of noxious substances and anticancer regimens).41–43 The primary mechanisms of action of d-glucarate may be through its ability to enhance detoxification of toxins and carcinogens as well as its antioxidative potential,44,45 which may be linked to the inhibition of MIOX. In addition, a derivative of d-glucaric acid, d-saccharic acid 1, 4-lactone, has been recently reported to be protective in both diabetes and its renovascular complications in rats.20,46 Likewise, we elucidated an important therapeutic effect of d-glucarate, which was through the inhibition of MIOX and thus, normalization of mitochondrial quality control, reduction of oxidative stress, and apoptosis in tubular cells with improvement in renal functions. Despite our extensive investigatory efforts, there are still certain issues that remain unresolved. For instance, the mechanism by which MIOX modulates Pink1 and downstream Parkin remains to be delineated. Also, whether MIOX plays a direct role in the regulation of mitochondrial dynamics and functions is worthy of future studies. In conclusion, this study shows the effect of MIOX on mitochondrial quality control disruption during DKD using in vitro and in vivo models. MIOX upregulation under HG ambience induces mitochondrial fragmentation and depolarization; meanwhile, it inhibits selective autophagic removal of damaged mitochondria through Pink1-dependent Mfn2–Parkin interaction. The net effect of these events would be disruption in the surveillance of mitochondrial quality control, accumulation of dysfunctional organelles, generation of ROS, and apoptosis, leading to tubular injury and DKD progression. Interestingly, the fact that d-glucarate could normalize mitochondrial homoeostasis by inhibition of MIOX would suggest a therapeutic potential of d-glucarate in the amelioration of DKD. Renal proximal tubular epithelial cell lines HK-2 (human) and LLC-PK1 (porcine) were used.17,18 They were maintained in media containing 5–30 mM d-glucose. For overexpression of MIOX and Pink1, cells were transfected with pcDNA3.1 or pcDNA-DEST47 plasmids. For gene disruption, cells were treated with MIOX siRNA using Lipofectamine 2000 reagent (Life Technologies). To pharmacologically inhibit MIOX, d-glucaric acid (Sigma-Aldrich) was added to the culture media and cotreated with various concentrations of glucose. N-acetylcysteine (Sigma-Aldrich) was added for 2 hours before glucose treatment to scavenge the ROS. MIOX plasmid construct and MIOX overexpressing cell lines were generated in our laboratory.16,17 A porcine MIOX cDNA was generated by RT-PCR and cloned into pcDNA3.1 (Life Technologies). The plasmid constructs and empty vector (control) were then transfected into LLC-PK1 cells, and stable transfectants were selected by growing cells in the presence of Geneticin and maintained. For Western blot analyses, whole-cell lysate, cytoplasmic, or mitochondrial extracts of treated cells were subjected to 5%–15% SDS-PAGE. The fractionated proteins were transferred onto nitrocellulose membranes, which were then incubated with various primary antibodies. The anti-MIOX was previously generated in our laboratory.18 Other antibodies included anti-Drp1, anti-Fis1, anti-Bax, anti-Cytochrome C, anti-Pink1, anti-Parkin (Santa Cruz Biotechnology), anti-LC3B (Cell Signaling Technology), anti-OPA1 and anti-Mfn2 (Abcam, Inc.), and anti-Atg5 (Gene Tex). After overnight incubation, the membranes were immersed in a solution containing individual secondary antibodies (Santa Cruz Biotechnology). Membrane blots were then used for developing autoradiograms using the ECL system (Amersham Biosciences). For coimmunoprecipitation, cell lysates from various experiments were used. They were incubated with respective rabbit polyclonal antibodies followed by the addition of protein A-Sepharose CL-4B, and incubation was extended for 12 hours. The antigen–Ab–protein A complex was pelleted and washed with RIPA buffer. The pellet was suspended in lysis buffer and subjected to SDS-PAGE for Western blot analyses. Cells were fixed with paraformaldehyde, permeabilized, blocked with BSA, and incubated with primary antibodies. After washing with PBS, they were reincubated with secondary antibodies conjugated with Alexa Fluor 488 or 594 (Life Technologies). Cells were counterstained with DAPI to delineate the nuclei and examined by confocal microscopy. For kidney tissue immunofluorescence, 4-µm-thick cryostat sections were prepared, mounted on glass slides, air dried, and rehydrated with PBS. Similarly, 3-µm-thick paraffin-embedded sections were prepared, dewaxed, and rehydrated. After blocking with BSA, sections were incubated with primary antibodies and then, Alexa Fluor-conjugated secondary antibodies. To assess the extent of apoptosis, TUNEL staining was performed on cells plated on coverslips and paraffin-embedded kidney sections using an In Situ Cell Death Detection Kit (Roche Applied Science).7 Ten random fields of cells (approximately 200 cells per group) were counted to determine the percentage of cells undergoing apoptosis. After various treatments, the live cells were incubated with Mitotracker dye (Life Technologies) and examined by confocal microscopy. Also, their morphology was assessed after paraformaldehyde fixation and detergent permeabilization. For each treated group, 10 fields of cells were randomly selected (>100 cells/group) to delineate the shape of mitochondria. To assess perturbations in the mitochondrial membrane potential (ΔΨm), the cells were stained with TMRE (Life Technologies) and examined by confocal microscopy.7 Average intensity of fluorescence from 10 randomly selected fields was measured using ImageJ software (National Institutes of Health, Bethesda, MD) to evaluate ΔΨm. For autophagy/mitophagy assessment, cells incubated with Mitotracker red dye were fixed and permeabilized. They were successively incubated with rabbit polyclonal LC3 antibody and secondary antibodies conjugated with Alexa Fluor. After counterstaining with DAPI, cells were examined. Ten random fields of cells (>100 cells/group) were evaluated to calculate the percentage of cells with punctate LC3. To assess intracellular and mitochondrial ROS production, cells were incubated with H2-DCFDA or MitoSOX (Life Technologies), respectively, and examined by confocal microscopy. Intracellular ROS production in kidney tissues was assessed using 4-µm-thick cryostat sections from various experimental groups and stained with DHE (Sigma-Aldrich).47 For both cells and tissue sections, 20 randomly selected fields were photographed, and mean fluorescence intensity was calculated. Eight-week-old ICR male mice (Harlan Co.) were used and divided into four groups (n=8): control, STZ-induced diabetic, and diabetic with 1% or 2% d-glucarate supplement. d-glucarate (1% or 2% [wt/wt]) was mixed with dietary chow.42 A diabetic state was induced by daily intraperitoneal injection of STZ (50 mg/kg body wt; Sigma-Aldrich) for 5 days. One week after the injection, mice with blood glucose levels>250 mg/dl were selected for dietary supplementation and euthanized after 2 months. All animal procedures used in this study were approved by the Animal Care and Use Committee of Northwestern University. Bimonthly body weight, blood, serum, and urine collections were carried out. Blood glucose was measured using the Roche Accu-Chek Advantage Meter. Serum and urine creatinine and urine albumin were assessed using the QuantiChrom Creatinine and BCG Albumin Assay Kits (Bioassay Systems). Urinary ACR (milligrams per gram) was calculated as follows: urine albumin (milligrams per deciliter)/urine creatinine (grams per deciliter). Three-micrometer-thick paraffin-embedded kidney sections from four groups of mice were dewaxed in xylene and rehydrated, and then, they were successively incubated with various primary antibodies and anti-rabbit IgG conjugated with peroxidase (ImmPRESS kit; Vector Labs). Sections were treated with diaminobenzidine or NovaRed substrate (Vector Labs) followed by counterstaining with Mayer hematoxylin and examined. MIOX activity in kidney tissues was determined as previously described.16,18 Briefly, cortices were homogenized in a buffer (20 mM sodium acetate [pH 6.0], 2 mM l-cysteine, 1 mM ferrous ammonium sulfate, 1 mM glutathione, and 1 mM PMSF). The homogenate was centrifuged, and the supernatants were saved for measuring protein concentration and MIOX activity by the Orcinol method. Renal cortices were minced into 1-mm3 pieces and processed for electron microscopy.7 After surveying the Toluidine blue-stained EPON-embedded sections, thin sections were prepared for electron microscopy to delineate the extent of mitochondrial fragmentation, autophagy, and mitophagy in tubules.28,50 Mitochondria having length>2 µm were considered filamentous, and those with length<1 µm and spherical configuration were designated as fragmented. The data were expressed as means±SEMs. Comparison of the results between two groups was evaluated by one-way ANOVA. P value<0.05 was considered statistically significant. This study was supported by National Institutes of Health Grant DK60635. Myocardial redox status, mitophagy and cardioprotection: a potential way to amend diabetic heart?